Mesoamerica, March 2, 2019 – On the night of March 2, 2016, some tried to put out her light, hush her rebellious words, and vanquish the fighting spirit of our comrade Berta Cáceres. They paid no attention to the fact that Berta, a Lenca indigenous woman, feminist defender of territory and the rights of Lenca communities and Lenca women, founder and General Coordinator of the Civic Council of Popular Indigenous Organizations of Honduras (COPINH) and member of the National Network of Women Human Rights Defenders in Honduras, is an example and inspiration for the women of Honduras, Latin America and the entire world, and that her memory and legacy continues to multiply and bloom. After criminal proceedings plagued with irregularities, violations and perversions of the judicial process, including denial of access to information, lack of an investigation by the Public Prosecutor, destruction and tampering with evidence, and lack of protection of victims’ rights, the intellectual authors of the murder are still free; for them, absolute impunity persists. Meanwhile, increasingly more women defenders in Honduras are being criminalized, prosecuted and even imprisoned for defending human rights, just as Berta was. The legitimate right to social protest and peaceful resistance in their communities is systematically and repeatedly repressed by State security forces. This makes it clear that the prevailing impunity in the murder of Berta Cáceres is part of the political strategy that has existed in Honduras since the coup d’État of 2009, aimed at maintaining a structure of territorial plunder and the closure of neoliberal democratic spaces to the detriment of the most basic rights of the people of Honduras and of the social movements, organizations, communities and persons who defend them. In the face of this brand of justice, both patriarchal and racist, which colludes with the national elites and transnational companies, the women defenders who make up the National Network of Women Human Rights defenders in Honduras and the Mesoamerican Initiative of Women Human Rights Defenders (IM-Defensoras), hereby send out a global call for the exercise of feminist justice, justice that goes beyond governments and corrupt institutions and keeps the memory and legacy of Berta alive. This is a call for the collective practice of conscious struggle for the emancipation of the women and peoples who experience historic exploitation and discrimination in their own bodies and territories. And so, #FeministJustice, #JusticeForBerta means fertilizing, protecting, and continuing to sow the seeds of change handed down to us by her life work and her word. It means shouting out against injustice. It means struggling against dictatorships and policies of persecution, terror and death implemented by governments that kill, repress, and impoverish the peoples of the world, particularly indigenous peoples, and persecute the bodies of women. Following the path of feminist justice for Berta means keeping on with the struggle against strategies of criminalization, plunder, and militarization of territories. Doing feminist justice for Berta involves confronting the exploitation and destruction of common and collective assets imposed by the neoliberal, extractive, racist, patriarchal model. What’s sexual is political, so doing feminist justice for Berta means denouncing hate crimes, remembering disappeared persons, never failing to search for them, and saying their names so that the politics of oblivion will not reign. Feminist Justice for Berta means self-convocation, being present, engaging in popular social movements for the freedom of our comrades jailed for defending the rivers, mountains, seeds, land and community. Feminist Justice for Berta means celebrating pleasure, experiencing the autonomy of our bodies, continuing the struggle for abortion, staying on the clandestine yet secure road that we have constructed against the patriarchal control of our bodies and the imposition of maternity, abuse, and sexual violence. Feminist Justice for Berta means not giving up the fight to oblige the intellectual assassins of her murder to pay for the threats, persecution and entire chain of criminal actions undertaken, up to killing her. Feminist Justice for Berta means that the government of Honduras, along with its judicial and political institutions must be subjected to social and juridical sanctions, both nationally and internationally, for their participation and complicity with interests aimed at the exploitation and plunder affecting the ancestral rights of indigenous peoples in their territories. Feminist Justice for Berta means coming to the defense of comrades in Guapinol who are doing feminist justice, justice for Berta, justice for the peoples in their struggle against mining interests. 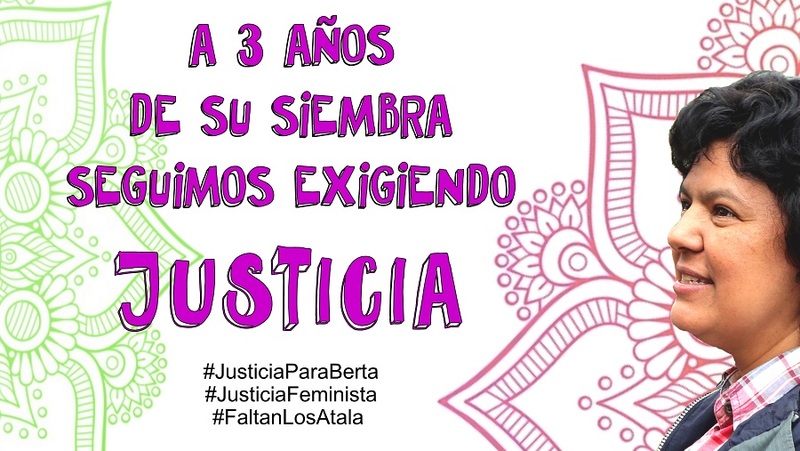 Feminist Justice for Berta is the struggle of indigenous women for freedom against macho violence in the community and structural violence in the patriarchal system.